Google’s frontend iPhone and iPad app for its Drive cloud-storage service has received a much-needed passcode lock feature in an update this morning. If your productivity depends on the Google cloud and you store your documents, presentations and spreadsheets in Google Drive, a thief was able to access all your files simply by launching the Drive app on a stolen device. Like passcode protection in Dropbox, Day One and a number of other App Store apps, Google Drive now lets you restrict access to the application using a four-digit passcode (which should be different than your iPhone’s lock screen passcode, by the way). 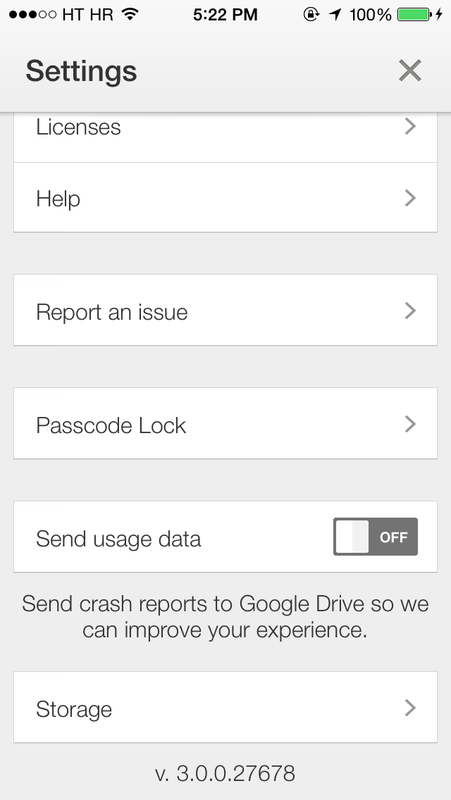 Simply launch Drive, go to the app’s settings and hit the new Passcode Lock option. On the next screen, flip the Passcode Lock switch to ON to set a four-digit password. 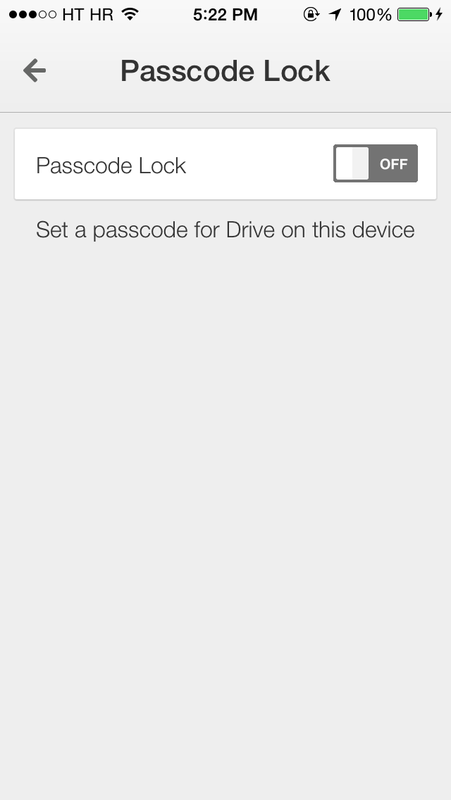 Note that each iOS device with Drive installed can have a different passcode. 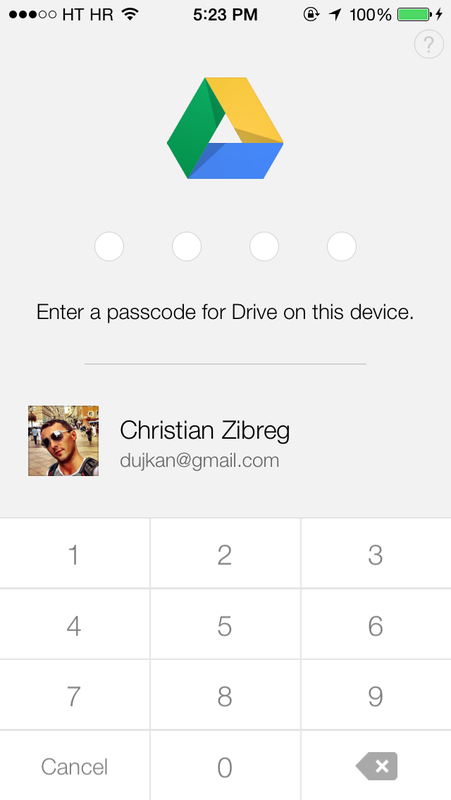 Once set, launching Drive will require punching in a passcode to access the file interface. You can change your passcode anytime in settings and optionally enable the Always Lock feature that tells the app to require a passcode whenever returning to Drive. In addition to a four-digit passcode protection of your Drive files, this update includes the obligatory bug fixes and performance improvements. 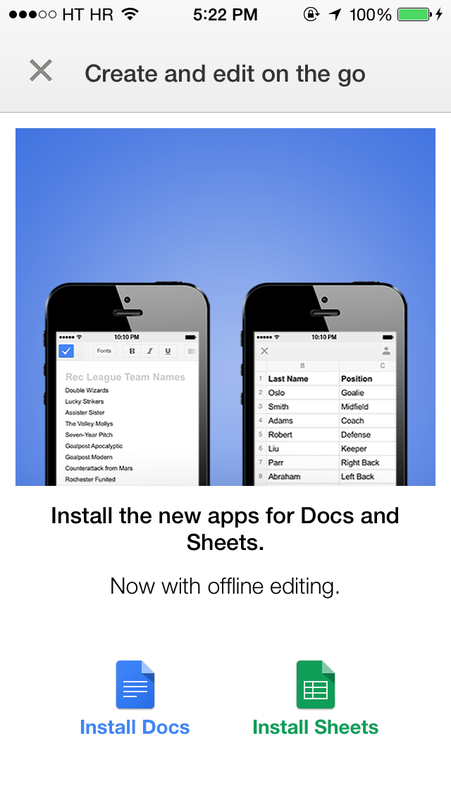 I’ve also noticed that launching Google Drive on an iPhone or iPad now puts up a message offering to install Google’s newly released standalone Sheet and Docs apps: first for editing spreadsheets on the go and the other for Google documents. I think Google is finding itself in a somewhat confusing situation because editing of Google Docs and Sheets has been part of Drive for months now. What we now have is Docs and Sheets functionality provided through both standalone apps and as part of Drive. Adding up to user confusion, enabling Drive access in standalone Docs and Sheets apps yanks you into Drive upon tapping on a cloud documents in either app. Worse, may not even realize it because all three apps have a remarkably similar appearance. According to Dave Mark of The Loop, Google’s version of Keynote and PowerPoint called Slides is said to be on its way to iOS soon. Download Google Drive 3.0 free in the App Store. The app is universal and requires iOS 7.0 or later.